One of Washington, DC’s most popular cooperatives is Shoreham West, an eight-story contemporary building with 58 extremely spacious residences. 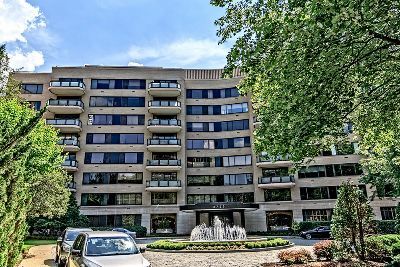 Listed in James Goode’s Best Addresses, the International-style structure was delivered in 1965 and has long been known for its full service amenities. It is located at 2700 Calvert Street NW in the Woodley Park neighborhood. The first thing that most people mention about Shoreham West is the sheer size of the floorplans. There are one, two and three bedroom models, as well as four bedrooms plus maid’s quarters. Measurements range from 1,850 to a whopping 4,650 square feet. Even the “smallest” units come with formal reception foyers with guest powder rooms, as well as elongated dining rooms. Master bedroom suites include dressing rooms and en suite baths. Almost all the residences have covered balconies. Other touches include thermostats for central air and heat in each and every room. The amenities at the pet-friendly building include plenty of underground parking, free guest parking, a 24/7 staffed front lobby and uniformed doorman. Residents also enjoy a huge rooftop deck with 360 views of the city. An additional interesting perk is secretarial service. Because maybe you need to dictate a document before heading to a meeting at one of DC’s many embassies? The neighborhood itself was once a summer retreat for influential Washingtonians such as U.S. Presidents Grover Cleveland and Martin Van Buren. Bordered by Cleveland Park to the north and Kalorama to the south, Woodley Park is also home to the Smithsonian National Zoo Park, as well as the Woodley Park-Zoo/Adams Morgan Metro Station. Co-ops for sale at the Shoreham West Cooperative Apartments have recently listed between $500,000 and $3,150,000. That said, available listings don’t come to market very often. Additionally, prospective buyers have to go through a meticulous approval process from the well-managed Board of Directors. But if you manage to cross all those bridges, you’ll find yourself with an apartment the size of a house! For more information, contact District Partners Real Estate, LLC, at 202-798-3600.